Pier Point is small oceanfront community with gated access. 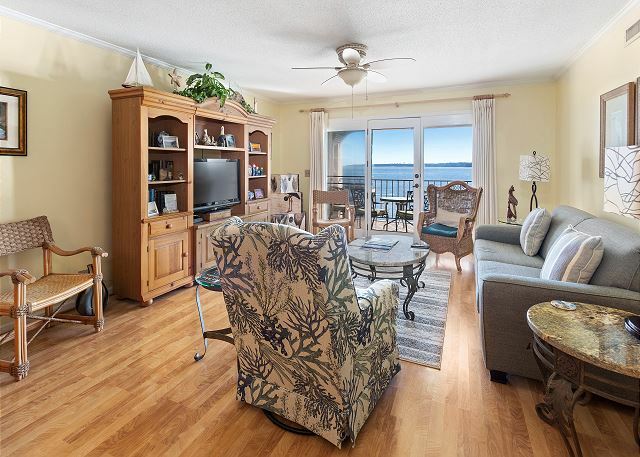 Wonderful unstructured oceanfront views you can enjoy from this top floor unit. 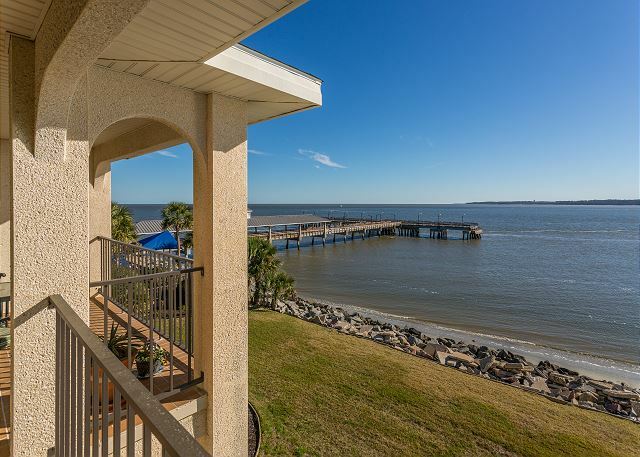 Sit back and watch the ships roll in, the activity on the Pier, and wonderful views of Jekyll Island Sound. You have access to the private Pier Point community pool. The complex next to the Pier Village with shops, restaurants, the iconic lighthouse, the new swim park, tennis courts up the street. Great location for walking and biking. 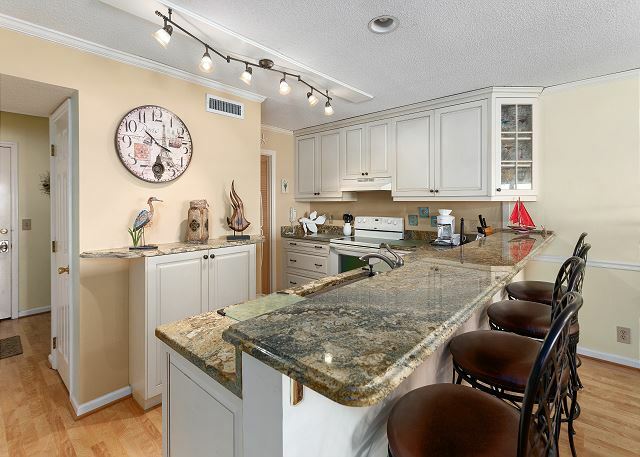 304 Pier Point is an older but well maintained condo situated on of the premier locations, adjacent to the village pier, on St. Simons Island. The condo is located directly on the ocean with 'killer' views and within 100 yards of village stores and restaurants. The property manager was quick to respond to an initial request from my wife and I. The kitchen was particularly well equipped. The lack of an elevator was an opportunity for exercise. Any recommended updates were shared privately with the property manager. The property is highly recommended. Always a great stay with Real Escapes! From check in to check out, Real Escapes takes such good care of everything. Check in...everyone is always friendly and I never have to wait for anything! Pier Point 304 is a great condo! The view is amazing, the air is cold!, the kitchen is beautiful, and the rest of the condo is very comfortable! Will totally stay here again! Only issue...that third floor climb with luggage!!! We love our time in SSI Pier Point is a great location for us .The accommodations are well decorated,clean and relaxing. The kitchen is equipped and ready to cook and serve any meal. We love our time on St Simon. The accommodations are clean and nicely decorated. The kitchen is well equip. The location is beautiful. We will be back again. We stayed 6 nights at Pier Point 304 over the holidays. The view is absolutely fantastic at sunset. The patio off the unit is so nice; hearing the waves crash against the rocks and watching the dolphins was awesome. The condo is very clean and has a nicely updated kitchen and bathrooms. The location makes strolling in the Village and taking in local cuisine a breeze. The Property Management company was friendly and professional; check in and out was easy. I would highly recommend this property. Almost perfect for our family! We thoroughly enjoyed our time in this beautiful condo from our morning coffee on the balcony overlooking the pier and waterway, days spent walking through the village or driving a short distance to the beach and evenings relaxing on the balcony...the condo itself was very quiet and private and well equipped for our needs. The only bit of concern was the extremely musty smell our first night; however, by the second evening it was much better. And we know this time of year it is not being used as frequently and it did improve on its own. Perhaps if it is aired out a bit more before the arrival of guests! Overall, we were very pleased and would come back! 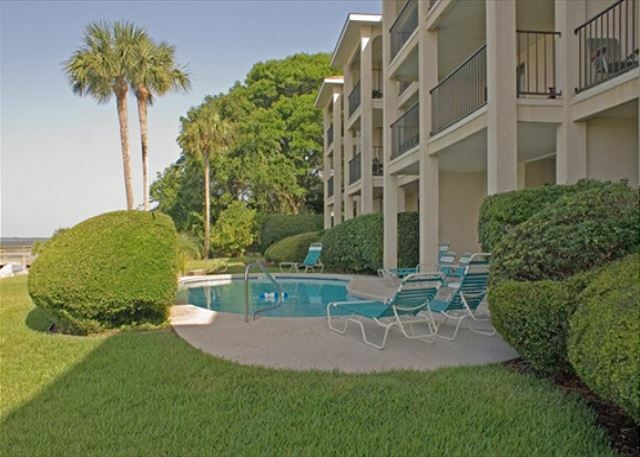 We have been vacationing in SSI for many years and this is our favorite place to stay. The location can't be beat as well as the view. The condo is extremely well equipped with all the comforts of home. The ONLY negative is that the couch needs to be replaced. When you sit on it you sink in (not in a comfortable way). A friend & I rented a condo for the month of April...close enough for our husbands to commute. Loved the location & time of year. we spent 5 weeks at Pier Point and it was everything we wanted and more. The location was perfect and the accommodations where great. We will be back again. We thoroughly enjoyed our stay at Pier Pointe. It is a beautiful well-appointed apartment in a perfect location within walking distance of fine restaurants and shops. For years my wife and I have said we would check out Pier Point if we ever sold our long time family place at The Grand. Well, that time came and we LOVE Pier Point!! We will be back multiple times in the coming years as long as there is an open slot during our desired visit times. Location, location, location!!! Some of best views on the island, especially the sunsets over the Sydney Lanier! Only bummer was MATTHEW, but that's nature! Thanks Jan Sala!!! Pier Point is the best place you can stay on St. Simons Island. The beautiful condo is close to everything, the restaurants, the playground and the community pool. Real Escape properties was amazing. I can say enough about the staff. They are always pleasant and will go above and beyond. I would recommend both Pier Point and Real Escape Properties to my family and friends. Wonderful property! Wonderful management company! Wonderful. The view was amazing. I stay at SSI often and this is the very best location. On Pier and ocean view. Unit overlooks ocean and pool. We recently stayed here for a girls weekend, as we do every year, and it was fabulous, as usual! We absolutely love sitting on the balcony and listening to the ocean and watching the people. The condo is always clean and has everything we need. There really is no better place to stay on the island. You can walk to great restaurants and shops and never need to use your car while you are visiting. We have stayed in this condo for years and we really enjoy the tranquility. It is so soothing to sleep with the door open at night and hear the sounds of the ocean. The large sofa in the living room could use a boost as the cushions slant forward but that is a little thing. Also we were curious as to what happened to the beach at low tide?? It was gone! Thank you for having us, we will be back! Nice condo overall. Negative: the master bedroom carpet had a distinct dirty wet dog smell. Needs attention! The bedskirt in the master bedroom had a large stain on it - looked like a dog had urinated on it. There was a slight urine oder in the room. 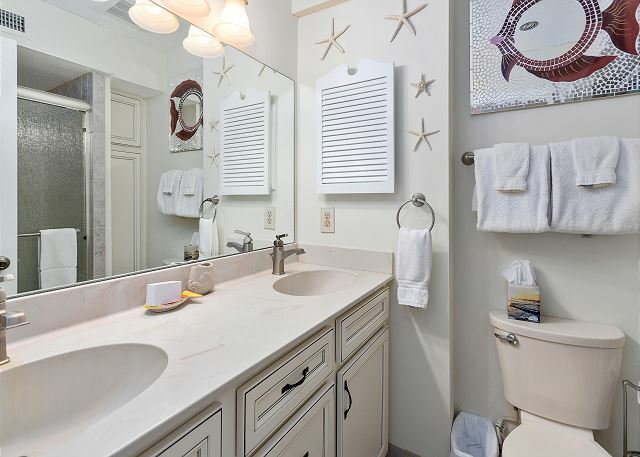 Master bathroom needs paint and a good cleaning of the baseboards, particularly on each side of the door. It's pretty gross. The fan in the master bathroom does not work, which might explain the peeling paint. Kitchen was very well equipped. Home was well furnished. Beach was elusive because it is so narrow. Difficult to time a walk to coincide with the low tide. Convenient location. Nice balcony. Great staff at Great Escapes. Very helpful. From the moment we drove into the gated parking lot, we knew we'd made the right choice. Everything is so convenient to the condo, I wouldn't be happy anywhere else again. The colors of the condo, along with the furnishings we perfect. The condo was amazing and very clean. Everything we could have needed was provided. The most amazing part of the experience is spending the weekend on the balcony, enjoying the breeze and the water while people watching on the pier. There is no better location on St. Simon's Island to stay. Restaurants, shops, the park all just outside your door! We will most certainly be back! We had another great time on the island with our daughter & her family. This was about our 30th trip to the island. We really enjoy the casual atmosphere of St. Simons. From the first phone call to Real Escapes to turning in our keys we had a great two week experience. This place is SO convenient to the shops and restaurants and our granddaughter enjoyed the playground nearby. BIG SHIPS along with dolphins added to our pleasure. Thanks Real Escapes and Pier Point. Great overall location. The condo is full of bric a brak and needs to be renovated, at least painted. We has to completely clean the condo on our arrival because it was dusty and covered in small black hairs. We had a chance to view a renovated unit and it was very nice. Real Escapes, a great company to deal with. We enjoyed our weekend in this beautiful condo! The views are amazing and the location is perfect for walking around the Pier and the village. It was lovely to sleep with the bedroom door open at night and listen to the sounds of the waves lull you to sleep. Thank you for making your home available!